With class-leading bandwidth, sampling rate and memory depth, and an array of advanced high end features, PicoScope 5000 PC Oscilloscopes give you the features and performance you need without compromise. An ideal direct replacement to benchtop oscilloscopes, PicoScope 5000 oscilloscopes are easy-to-use and cost-effective. The PicoScope 5204 is the vanguard of PC Oscilloscope design, whilst for those on a budget, the PicoScope 5203 has all the performance of the 5204 but with a smaller, though still impressive, 32 megasamples of memory. At the heart of the PicoScope 5000 is its ability to digitise signals accurately and with minimal distortion. The 250 MHz analog bandwidth is complimented by a real-time sample rate of 1 GS/s. For repetitive signals, an equivalent time sampling (ETS) mode increases the sampling to 20 GS/s. As well as the standard range of triggers found on most oscilloscopes, the PicoScope 5000 series has a full complement of advanced triggers as standard to help you capture the data you need. 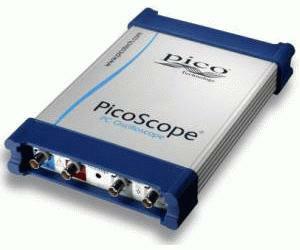 PicoScope 5000 series PCOs feature a built in signal generator output. This can generate standard waveforms from a library of stored waveforms including sine, square, triangle, ramp up, ramp down, sin(x)/x, Gaussian, half sine, white noise and DC level. You can also define your own waveforms using the power of the built in 12 bit, 125 MS/s arbitrary waveform generator (AWG). PicoScope 5000 oscilloscopes are supplied with PicoScope 6 oscilloscope software which allows you to use your PicoScope PCO as an oscilloscope, spectrum analyser and meter. PicoScope 6 is just as easy to use as its predecessor and makes the same efficient use of screen space, but is now even more responsive and has a more modern user interface. New features in the software include draggable axis, improved zoom tools and a waveform replay tool which automatically records the last 32 waveforms. If the 128 M sample record length is not enough, the supplied drivers and Software Development Kit allows users to write their own software or interface to popular third party software packages. The drivers support data streaming functionality, where gap-free continuous data can be streamed via the USB 2.0 port directly to the RAM of the PC or hard disk drive at up to 6 MS/s.